Simon & Schuster, 9780684871226, 864pp. Bestselling winner of the 1986 Pulitzer Prize, Lonesome Dove is an American classic. 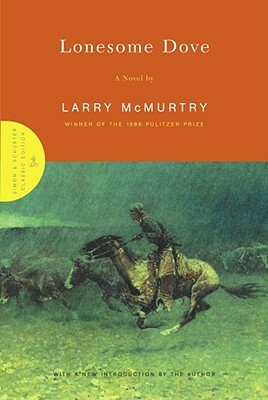 First published in 1985, Larry McMurtry's epic novel combined flawless writing with a storyline and setting that gripped the popular imagination, and ultimately resulted in a series of four novels and an Emmy-winning television miniseries. Now, with an introduction by the author, Lonesome Dove is reprinted in an S&S Classic Edition. Lonesome Dove, by Larry McMurtry, the author of Terms of Endearment, is his long-awaited masterpiece, the major novel at last of the American West as it really was. A love story, an adventure, an American epic, Lonesome Dove embraces all the West -- legend and fact, heroes and outlaws, whores and ladies, Indians and settiers -- in a novel that recreates the central American experience, the most enduring of our national myths. Set in the late nineteenth century, Lonesome Dove is the story of a cattle drive from Texas to Montana -- and much more. It is a drive that represents for everybody involved not only a daring, even a foolhardy, adventure, but a part of the American Dream -- the attempt to carve out of the last remaining wilderness a new life. Augustus McCrae and W. F. Call are former Texas Rangers, partners and friends who have shared hardship and danger together without ever quite understanding (or wanting to understand) each other's deepest emotions. Gus is the romantic, a reluctant rancher who has a way with women and the sense to leave well enough alone. Call is a driven, demanding man, a natural authority figure with no patience for weaknesses, and not many of his own. He is obsessed with the dream of creating his own empire, and with the need to conceal a secret sorrow of his own. The two men could hardly be more different, but both are tough, redoubtable fighters who have learned to count on each other, if nothing else. Lonesome Dove sweeps from the Rio Grande (where Gus and Call acquire the cattle for their long drive by raiding the Mexicans) to the Montana highlands (where they find themselves besieged by the last, defiant remnants of an older West). It is an epic of love, heroism, loyalty, honor, and betrayal -- faultlessly written, unfailingly dramatic. Lonesome Dove is the novel about the West that American literature -- and the American reader -- has long been waiting for.